I purchased my Bar Crusher 680C (now 730C) in December 2006, my previous boat (for five years) was a Quintrex 530 Coast Runner which I outgrew. I found myself venturing further and further offshore and decided I had better upgrade to something bigger. My first introduction to the Bar Crusher was a couple of years before I purchased the Quinnie, I read about them in a magazine and was impressed with the article and the boat but at the time there were no dealers in WA so after much investigation settled on the Quinnie. This time around I was really looking at fibreglass hulls, looking for a better/safer ride. I had done the rounds of most of the dealers in Perth and looked and dreamed on the internet, but could not find anything that suited me or would fit under my garage and most of them were well outside my price range. Along comes another article on Bar Crusher in the paper and with a dealer in Perth, Offshore Marine. Armed with all possible information off the internet and a tape measure I headed to the dealer to get a price and see what’s what on the boat. I crawled all over every Bar Crusher in the yard, measured everything that could be measured and because of the folding hard top and folding windscreen I knew it would fit under my garage. The deck (fishing) space was huge and everything seemed to be in the right place. Well, I was impressed and settled on the 680C. It is now just under 12 months and 80 hours since I purchased the Bar Crusher, I have caught a lot of fish and I am still impressed with the boat. 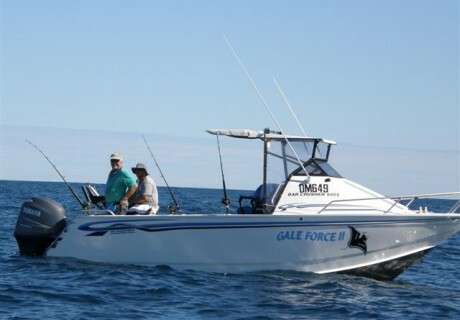 Most of my fishing is in Exmouth WA and I have experienced some good and some not so good weather. On one such trip a mate called us up on my home base radio and said come out there’s only a little wind and pretty flat seas. So off we ventured out to the area between Norwest Cape and the Murion Islands, commonly referred to as the Slot. By the time we got there the light winds and flat seas had turned into a howling gale and wild rolling seas full of white caps. At this stage we should have turned tail and headed for home (like my mate had done) but I decided to head to the west side of the Cape to look for calmer waters and maybe some fish. To get there we had to navigate between the Cape and Northwest Reef, not normally difficult but as we began surfing down the following wild rolling sea, I and my crew became a little apprehensive, nothing was said but we were both hoping the nose would lift when we got to the bottom of the wave and lift it did, no water over the bow straight onto the next wave. We kept this up until we were passed the reef and into calmer waters, not much calmer but a little. Going home was not much better except now we were heading into the seas and this time we headed out wide and went around the reef. We never caught a single fish and it was probably the roughest day I have ever had on the water either in my boat or somebody else’s boat but the Bar Crusher proved its ability to handle the rough stuff. We both got wet that day but only from spray nothing came over the bow, there was no thumping or banging, no broaching or anything that would cause you to worry. The Bar Crusher just performed beautifully and instilled a lot of confidence in both myself and my crew, not that we want to do that too often but if you get caught it is nice to know the boat will handle it. I have attached a photo one of the Bar Crusher and one of some fish caught in Exmouth. Both photos were taken on better day than the one detailed above.